CALIFORNIA(Scrap Monster): carbonLITE, leading producer of bottle-grade raw material used to make new bottles, announced the opening of the world’s largest bottle-to-bottle recycling plant in Riverside, California. The 22,000 sq-ft plant has already created over 100 green jobs and is expected to recover more than two billion plastic PET bottles annually from California’s Curbside and Redemption Value programs. The Grand Opening Celebration and Ribbon cutting ceremony was honored with presence of California Governor Edmund G. Brown Jr and notable guests from the State of California, US Environmental Protection Agency, Country of Riverside, City of Riverside and riverside Chamber of Commerce, along with executives from Pepsico and Nestle Waters. carbonLITE is bringing change in to the system of exporting plastic bottles from California to China and getting it recycled into polyester fiber. carbonLITE is able to do this with the support of their customers like PepsiCo and Nestle Waters while helping both companies achieve their sustainability goals. 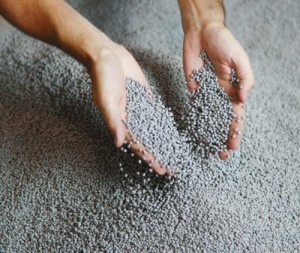 carbonLITE specializes in processing used plastic bottles into bottle-grade PET pellets that can then be used to manufacture new plastic beverage bottles. This conserves virgin resources, reduces landfills, and capitalizes on the energy already invested in making existing plastic products.